Tyroseal, is a liquid (gel) puncture sealant that is injected into tubeless, pneumatic tyres that offers permanent guaranteed puncture protection for the life of the tyre. When a tyre that has been treated with Tyroseal encounters a puncture, air pressure inside the tyre forces Tyroseal into the wound forming an instant and permanent repair. It takes only a small amount of Tyroseal sealant to repair a puncture, there is sufficent material left inside the tyre to remain effective against many more punctures to come! Tyroseal is non-hazardous, non-toxic and fully biodegradable. The product is fully water soluble and may be washed away with water. Tyroseal will not cause wheel imbalance when correctly installed and will not affect the balance of your tyres. 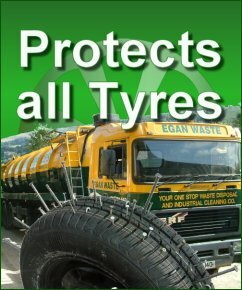 Tyroseal does not affect manufacturers or extended warranties on tyres or wheels. Further information can be read on our “Product Information – Details”.